The year is 1916. The anarchists Hugo Bale, Tristan Tzara and Marcel Yanko establish the modernistic art movement “dada”.This movement guests for something they called “essence of spirit” , pleads for freedom of self-expression and is regarded as a protestagainst World war 1, conservatism of the middles classesand moral degeneration of humanity.But dadists fought for an another idea: expression of ideas through sounds instead of words, considering this method more liberal and pure.They want , througha mixof sounds, to demolish all established ethic of social barriers. Dadaists create music based fully on new-born industrial sounds.Kurt Schwitters’ compositions such as “Anna Blume”1919 and “Ursonate”1923 laid the foundations of one one of the most abstractand atractive types of musicof the 20th century. Luigi Russolo, Italian futurist painter and composer, was also inspired by Dadaist’s ideas and maked a model of mashine producing noise.He creates the so-called “noise-moderatos (“Intonarumori”) in 1912, instruments which were used later on by composers like Igor Stravinsky in order to produce natural sounds .These years , in collaboration with the Dadists. 1920. The russian electronic genious Lev Teremin creates the first prototype of sintesizer using electromagnetic waves. Sound is created without making physical contact with the instrument. The first sintesizer “Teremin” creates different tones and sounds which are made only by the movements of the musician in the space. They are remembered with the creation of styles like soul, disco and funk.Giorgo Moroder is still accepted as a pioneer of the pro-sintesizer electyronic and disco music. In these years “high energy” celebrates its own triumph , mostly in gay clubs, and labels like “Sal Soul” create never heard electronic version of gospel style. And suddenly “Kraftwerk” appear on the scene. They are said to be fathers of hip -hop, as well as of the electronic music. They themselves are something like a bridge between their own time and the future. The year is 1971 “Kraftwerk” use drum machine and electronic conception as a basais for their music.Their first works ,like “Autobahn”(1974) and “The Man Machine” became classic.Kosmorockers form Berlin , “Tangerine dream”, soon turn in to the new experimental group on electronic music. Jean – Michel Jarre is also ambicious in this and makes his ambitions reality with his total blockbuster of 1976 “Oxygene”. In San Francisco, Alan Vega and Martin Rev create their band “Suicide”, which establishess a good basis for the stabilization and the triumph of electronic music in the 80s. Then comes the “new wave”. The “seeds” of “Kraftwerk”are new grown. In the late 70s come new bands like “Human leage”, “Ultravox”, “Yellow Magic”, “Simple minds”, “New Order” etc. All they go to the heads of the toplists. Something fresh comes from Europe. Young European bands like “Depeche Mode”, “Heavan 17”, “Yellow” etc make exceptional electronic sound. Slowly but surelly “Skinny Puppy” from Canada are coming near the new sounding, while in Frankfurt the first techno club “Talla2XLC” opens up.On the other hand the hip hop culture later on takes its part in forming the breakbeat. CHILL OUT – Supreme feeling, smooth techno style, relaxing. AMBIENT JUNGLE – Runaway beyond the borders of music. Most popular among the drum&bass generation. HIGH ENERGY – Gay disco anthem. Become almost a religion for homo-sexuals. Later it is an inspiration for the trio of producers – Stock, Aytkon and Water Man, who gave exceptional performers to the music industry. INDUSTRIAL – The bands which preach this style declare themselves as futurists and and anarchists tearing apart every musical chains and creating music non-existing till that moment. NEW WAVE – something like the sequence of the history of punk revolution but but it’s more dramatical and tender. The New wave belongs to the 80’s and the popular music. NEW ROMANTICS’ – For the first time since the 60’s it’s modern to represent the higher class. Pretty soon almost all of the teenagers start to look like “dandies” from 18th century while listening in their class breaks groups like Spandaw Baley and ABC. TECHNO – It’s roots are hidden in Detroit. 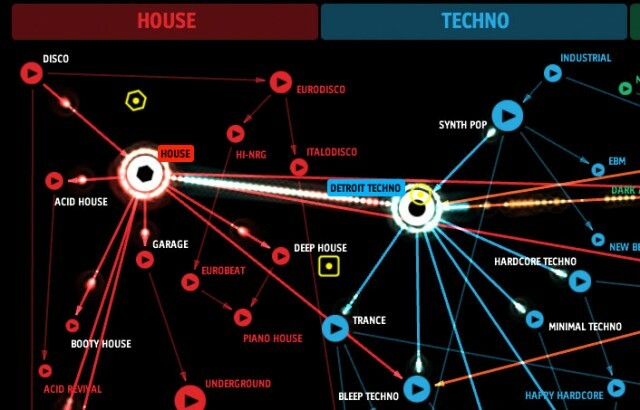 Main culprits are Derick May, Kevin Sonderson and Huan Atkins who under the influence of “Craftverq” create their music but way more hypnotic especially after the invasion of the Chicago House. Nowadays the term is associated mainly with the electronic club music. HIP-HOUSE – Fusion with rap and house beats. Originated in 1986. Main missioner is Africa Bambata who mixed rap and house into one type of music. ITALO-HOUSE – Dominant piano, American vocals and italic house sound. The whole combination leads to the appearance of outstanding things at the end of 80’s and beginning of 90’s. “Ride on Time” and “Black Box”. Tremendous success also of the “Kapela” project. Some new companies show up like “Rolling tune” and “Progressive” which follow and support the evolution of the fully competitive italiano house Rene sans. DUB – If you take away from the reggae everything but the drums and the bass line you’ll get the main formula of Dub music. Add some echo guitars and some hot sound effect. Dub is one of the inspirations of the early rap. JUNGLE AND NEW BEAT – a mix between Detroit Techno and Euro Dance. GOA TRANCE – 60’s the Goa area in India. The earliest Goa trance activities are in the music of popular bands like “Pink Floyd”. Later the guitars make way for the speed gaining electronic sounds. ELECTRO FUNK – something like a substitute of disco idols with robots. One of the bright representatives is “Prince”, also a legend is “Africa Bambata”. BROOKLYN – Manhattan has it’s disco, Bronx – hip-hop, Jersey – garage music. But from the end of 80’s Brooklyn turns into a home of the techno in New York and his missioners are Joey Beltram, Frankie Bowns, Daimond Wild, Adam X etc. DETROIT – a city which has inspired a lot of the today’s techno artists. BEAT – fundamental unit for rhythm. Rhythm defines the styles in techno. LABEL – Record company. In techno music there are thousands of famous and less famous leading and independent labels. SAMPLE – moment of different song which an artist gets and remakes creating something absolutely new. Vocals and melodies can be taken. Do you know how the vinyls are made? here or part 2 here.